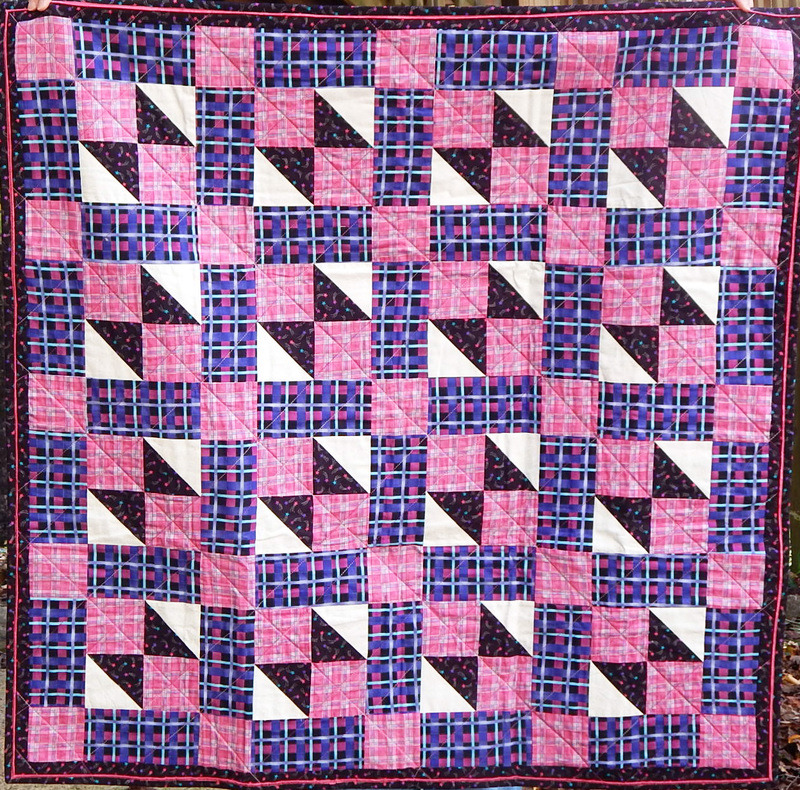 This entry was posted in Quilting and tagged quilt class, quilt classes, quilting by zippyquilts. Bookmark the permalink. I like the idea of adding a personal touch to a pattern. I think of it as collaborating with another artist. Sometimes the change is made by “accident”; sometimes it just my interpretation. I had never thought of Maxine binding, since I always thought it was a no-no. I might give it a try if I think the quilt benefits from another line. Thanks for sharing this. I always learn something from your posts. I think that we should always strive to do our best in whatever we do. 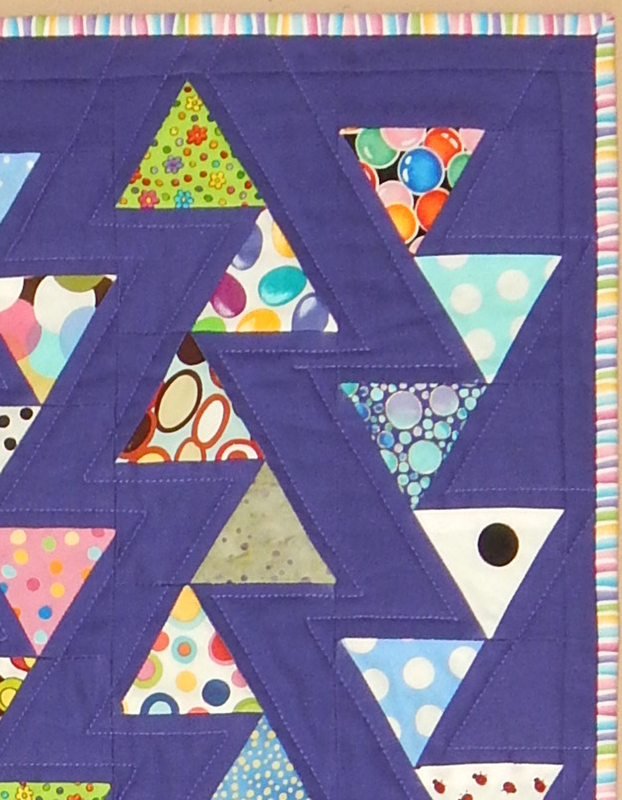 Attention to stitching lines and seam allowances do make for a well aligned quilt. However, if points don’t exactly match up, oh well. Quality construction is more important to me. As far as changing designs, that to me is just artistic expression. I actually worry about the people who never think outside of the box. Conformity, to me, is boring. JMO. You mentioned machine binding and how you think it is at least as attractive as hand stitching the binding, well I have to say you have never seen my machine bindings, LOL. My machine bindings are simply awful. After spending so much time working on the quilt itself, it is a shame to ruin it with one of my machine stitched bindings, so I hand stitch them. So things I will never be able to master and that is OK. This has been a great post, thank you for sharing. I’ve never done a large size quilt’s binding by hand. I know a few people who would only do a binding by hand, but I like machines (although they don’t always cooperate fully with me). Having always been the child who “had to learn the hard way,” I don’t like accomplishing tasks to fit someone else’s expectations. Although I can see how my own shoddy application, if I let it go as is, will ultimately steal some of my self esteem away…I love your creations, and not because of the tight mitering and even stitches, necessarily, but the combination of colors and animated designs bring pleasure! I have quit taking classes where all the instructor does is teach how to do a pattern perfectly. If I use a pattern I will probably change it up somehow. I even remember when machine quilting was a no-no; I am that old. 🙂 So far I haven’t done machine binding on a “good” quilt, but I keep practicing on charity quilts where I think the extra durability is needed. I gave up worrying about how it looks on the back. I too change things up. But I am not changing them up for lack of experience, perhaps that is what the instructor thinks. I think the classes want you to walk away with what they deem as perfect (yup the dreaded quilt police do exist). At the same time being an instructor, you want them to leave with a make and take that will be finished. I have never understood the classroom sewing craze. Experience happens perfectly and imperfectly, so regardless of perfection you have learned what works for you and what doesn’t. What works for some doesn’t work for all. I used to be someone who would hand stitch all my bindings. I realized the people I am giving them to have no idea or care. One’s I keep I hand stitch. One’s given away are good practice for machine binding in leiu of finding what works. I make my own rules, a quilin rebel at heart! I love this statement: “I quilt for my own satisfaction, and my version of fun involves developing designs rather than copying somebody else’s design as precisely as possible.” – I like that philosophy! I’m with you. I rarely use a pattern but use lots of inspiration from pictures and generally make things up on the fly! I don’t have the patience for following all the rules or making it perfect! I’d much rather play with the color and design. I also love machine binding. For one thing, I can always use the excuse that hand sewn binding hurts my hands….and by the time I get to the binding, I just want it done! I love how fast it is and it’s so rewarding to see the finish come quickly. Thanks for validating my method! Love your work and your spirit. I think applying the binding by hand gives me the closure I need for finishing a quilt…it is my preference, and that is why I quilt anyway…to slow my life down, so it is relaxing. Loved this post! Having just taken a class, it articulates what I felt many times: that I should do X or Y *her* way, not my own. It began to be frustrating so I just sort of slunk off and kept at it. I also hate when they try to demo on MY project. No, thank you. 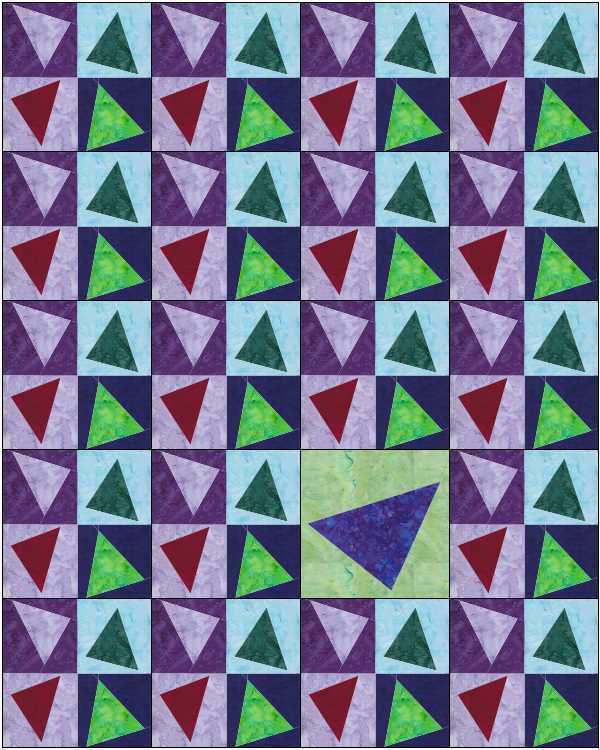 I love how you deviated with one large triangle in that sea of triangles–it’s wonderful and really gives a zing to that quilt. Lastly, I go alternate on the machine-stitched binding; it’s all quilt-specific to me. Thanks for a great post!